Facebook wants to help other businesses sell things, so it’s done selling its own. Facebook Gifts will shut down on August 12th and stop selling gift cards for businesses like Starbucks and iTunes. Facebook tells me no layoffs will occur, and most of the team has already been reassigned to other commerce initiatives it’s concentrating on. Those include the Buy button for making ecommerce purchases within Facebook, Auto-Fill for auto-populating your billing info in other shopping apps, and Custom Audiences that let brick-and-mortar merchants retarget Facebook ads to existing customers. By selling ads and potentially charging a revenue share for products bought through the Buy button, Facebook could make plenty of money on commerce without having to host its own Gifts store or bombard people with Gifts prompts on their friends’ birthdays. In September 2012, Facebook launched Gifts to a test group in the US. Based on its acquisition of gifting app Karma, it was a cutesy online shop within Facebook for buying chocolates, teddy bears, wine, and gift cards for friends. What was especially useful was that you didn’t need to know a friend’s address to send them a physical gift, unlike Amazon. Facebook would post a “wrapped” gift to your friend’s wall that they could open, see a personal message from you and be asked for their shipping address. Facebook took a cut of the purchase price in exchange for promoting Gifts and managing fulfillment with its own warehouses. Wall Street responded positively, as there was (overly optimistic) hope it could make serious money by disrupting Amazon with its data on what people Liked and who their friends were. The $FB share price bump from Gifts was important because at the time Facebook’s share price was hovering around $20, far below its IPO price of $38 (it’s at an all-time high around $74 now). A source tells me that at the time, Facebook was desperate for new revenue streams around ads or anything that would convince investors it had potential. But the Gifting experience just didn’t fit naturally into Facebook, many of the Gifts were kitschy junk, and people just didn’t want to spend money sending them to friends. And while handling shipping was feasible in the continental United States, Facebook never found a way solve distance and localization problems to make Gifts work internationally. Facebook scrambled to shoehorn Gifts into its popular birthday calendar. Instead of the traditional “HBD” wall post, Facebook aggressively pushed people to buy friends small gifts. It didn’t take. Facebook signed more gift card partnerships like one with iTunes, and launched its own ‘Omni-Gift Card’ that could be refilled with credit to an array of businesses like Target and Olive Garden. But my own attempt to use the card was awkward as clerks had never heard of it. Facebook ditched the physical gifts business entirely in August 2013, and doubled-down on gift cards, which were 80% of sales already. It gave brands their own URLs for their Gift card stores, and concentrated on personalization by using its treasure trove of interest data to recommend what you should give a friend. Still, no luck. Gifts were long suspected to be a failure, the company avoided talking about them in earnings calls, and didn’t push any product updates. The beginning of the end came earlier this year when Facebook quietly stopped letting people add credit to the omni-cards. And now it’s dead. In retrospect, Gifts looks like a clumsy stab in dark of ecommerce. Post-IPO, Facebook was willing to try pretty much anything to make money, especially on mobile. Facebook typically operates as an open platform without injecting too much of itself. But Gifts felt overly branded and heavy-handed, like an elephant in pageant make-up with nowhere to stand. The experience should teach Facebook to stick to its strengths: advertising and delivering traffic. Gifts will stop being sold August 12th and Facebook is currently notifying partners to expect no more orders. Anyone who has an unredeemed code for a gift card will be able to redeem it directly through the merchant, which each have their own expiration policies. Facebook’s Omni-Gift Cards with remaining balances can still be used. Since any Gift that’s not “unwrapped” after two weeks gets returned, there won’t be Gifts left in limbo. With Gifts on its way out, Facebook can focus on what does work: helping businesses sell more to Facebook’s users, rather than selling products to them directly. Instead of replacing their stores, Facebook just wants to smooth the checkout flow, show ads that lead to purchases, and prove those ads work. The Buy Button: This lets Facebook businesses publish Page posts and ads which show a Buy button that lets people purchase things without leaving Facebook. Rather than having to click through to a merchant’s website, users can enter credit card info directly into Facebook or use a card on file to complete the checkout flow in-line. This shaves both the website navigation and clumsy billing info entry steps off the conversion funnel. The Buy button lets Facebook to drive businesses more sales, especially on mobile where users loathe leaving their favorite apps and tapping in credit card numbers. Facebook isn’t taking a revenue share from Buy button sales currently but tells me it was “not disqualifying that option” in future, which could become a big new revenue stream. As long as businesses are getting more sales, they may be happy to give Facebook a cut. Autofill With Facebook: This tool for third-party ecommerce mobile app developers lets business like JackThreads put an “Autofill With Facebook” button into their checkout flows. Instead of having to type in their credit card info, if a user has a credit card on file with Facebook, the button will auto-populate their billing info into the app for a speedy checkout. Facebook isn’t taking a cut of these purchases just yet either. 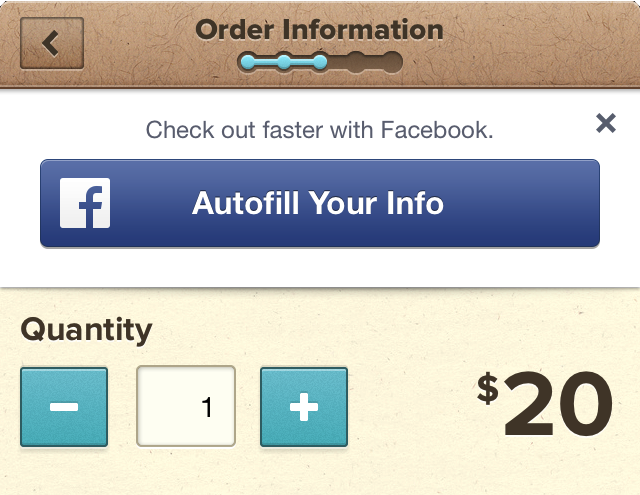 Instead, Autofill lets Facebook know how much which users are spending in what apps. It can then connect this to data on who clicked what ads to prove the return on investment of mobile app install and re-engagement ads to ecommerce developers. Multi-Product Ads: These let businesses show off three different products in a single ad that users can scroll through horizontally. Each item has its own description and click destination. It could be combined with Facebook’s new scrollable multi-product ads to create a mini-shelf of buyable products within the social network. Facebook says former Karma CEO and Gift’s head Lee Linden is now working on its commerce ads products. Custom Audiences: Facebook wants to help drive offline purchases too. With Custom Audiences, businesses can upload sets of email addresses or other identifying information of different subsets of their customers into Facebook’s ad tool in a privacy-safe way. They can then retarget these users with ads. For example, if a car dealership got someone’s email address who test drove a car but didn’t buy it, it could use Custom Audiences to show them ads tempting them to pull the trigger and buy the car. Offline Sales Measurement: Facebook can also use Custom Audiences and partnerships with data providers like Datalogix to track if its ads are driving offline purchases. When it gets lists of people who made purchases straight from the businesses or its data providers, it can match them against its ad data and prove their ROI. If businesses know buying Facebook ads nets them more sales than they spent on ads, they’ll increase their spend. Gifts may have failed, but Facebook has so much data on who people are, what they care about, and what they buy that it has plenty of other ways to inject itself into commerce.